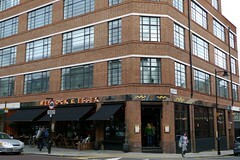 A bar on Essex Road in Islington, which replaced a chain bar called Living Room in around 2010. For all its external office-block appearance, inside the bar is attractive and colourfully lit photo, with polished wooden floors, sturdy wooden furniture and a long, three-sided bar area photo. There are no partitions except for some large concrete pillars holding the roof up, but there's a carpeted area to the rear with booths. On Ewan's Monday early evening visit, the place was hardly busy, but it is likely to be lively at peak times of the week and weekends. They have a cloakroom downstairs and advertise free use of its facilities on Friday and Saturday evenings. There are also plenty of events listed on their website and on posters, including film nights and DJs. There are four handpulls for ale on the bar, with Purity Pure Ubu, Plain Ales Innocence, and Weston's cider on Ewan's October 2012 visit (one was off). There are also plenty of draught keg beer options, including branded fonts for Camden Town Pale Ale, Hells Lager, Wheat Beer and Camden Ink stout, BrewDog 5am Saint, Paulaner, Erdinger and Brooklyn Lager. They also had taps for Freedom Stout and Thornbridge Tzara (£2.50/half), along with some other basics. Food is served from a short menu covering some classics, which come with beer matching recommendations. Ewan tried their WE burger with extra bacon and cheese (£10 basic, with 50p for each extra) photo, which came in a brioche bun and was excellent quality, just the right shade of pink (I requested medium-rare) and some fine chips. They also do burger specials. On Ewan's early evening visit, music was playing but not very loudly, and there were a few other tables taken. The atmosphere was very pleasant, and service was friendly. Toilets are downstairs, are large, well-kept and clean. Accessibility: Two steps to get in, with toilets downstairs. Last visited by Ewan and Kerry, October 2012. Last edited 2013-05-10 08:14:09 (version 3; diff). List all versions. Page last edited 2013-05-10 08:14:09 (version 3).